Globe vs. Smart: Who’s Faster in Mobile Internet? Once again, Smart Communications outsped Globe Telecom in terms of mobile internet speed, according to mobile operator analyst OpenSignal. 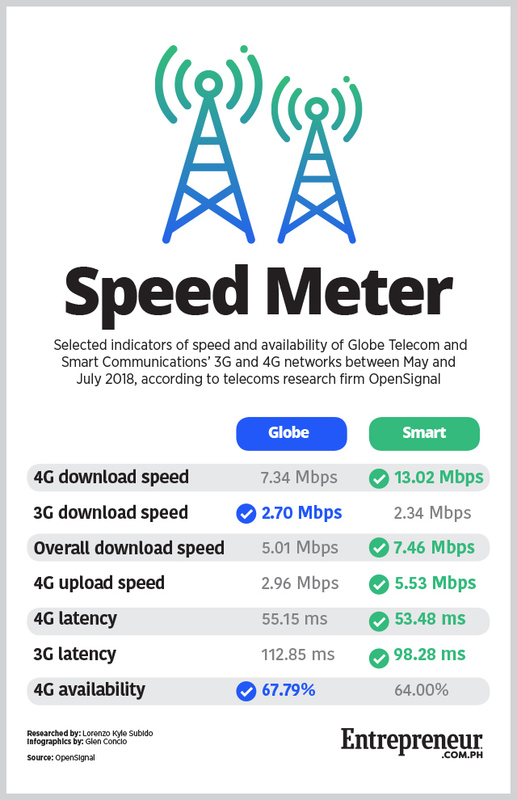 In its report titled “Mobile Networks Update: Philippines (August 2018)," OpenSignal revealed that Smart recorded an overall average download speed of 7.46 Mbps between May and July 2018, higher than Globe’s average of 5.01 Mbps in the same period. OpenSignal arrived at the figures by measuring the speed and availability of 3G and 4G connections across both networks. Smart also led in terms of 4G or LTE download speed, which reached an average of 13.02 Mbps. However, Globe slightly edged out in terms of 3G download speed, averaging at 2.70 Mbps for the period. OpenSignal highlighted that mobile internet speeds have “risen considerably” for both networks in the past six months. Indeed, Smart’s overall download speed rose by 29.1 percent from OpenSignal’s previous measurements, which tracked speeds from November 2017 to January 2018, while Globe’s overall download speed saw a similar increase of 13.6 percent. “As the Philippine government tries to entice a third mobile operator into the telecom market, the archipelago nation’s two incumbents are continuing to build out their 4G services, extending their LTE signal reach and boosting mobile broadband speeds bit by bit,” wrote OpenSignal. The report also showed other metrics such as upload speed, availability and latency, which OpenSignal defines as “the delay data experiences as it makes a round trip through the network.” A breakdown of all these metrics, and which of the two telcos reported better measurements, is shown in the infographic above. OpenSignal compiled the data from over 949 million measurements across 76,000 devices in the country. The data was gathered from May 1, 2018 to July 29, 2018.